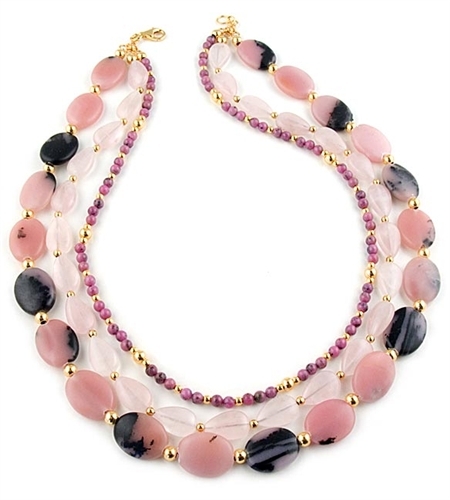 Pink Opal, Rhodonite and Rose Quartz gemstone beads necklace by Angelo De Soto. This stunning necklace features three strands of gemstones; 14x10mm pink opal ovals, 4mm rhodonite and 16mm rose quartz drops intervened by 3mm and 5mm 18 karat gold vermeil balls. Necklace measures 48.5 cm (19.1") in total length and fastens with a lobster clasp. A classic designer necklace that can be worn all day and update your outfit bringing a touch of classic elegance. Also makes a wonderful gift for a loved one. Available exclusively in the UK from Farfallina.net Jewellery Boutique.